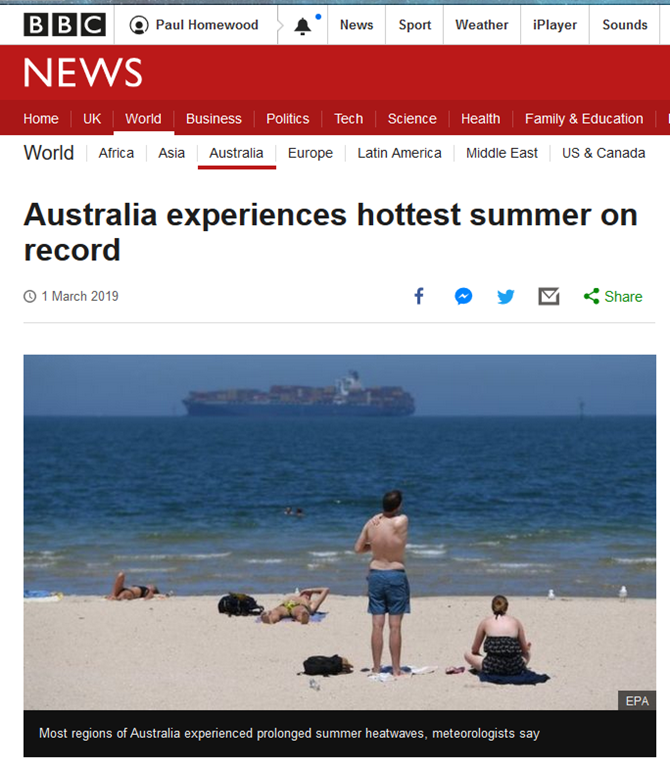 "The real standout was just how widespread and prolonged each heatwave was – almost everywhere was affected," climatologist Blair Trewin told the BBC. Temperatures had exceeded the previous hottest summer in 2012-13 by nearly 1C, he added – "a very large margin for a national record". Naturally the Australian Bureau of Meteorology has blamed it on climate change. But is it quite as simple as that? 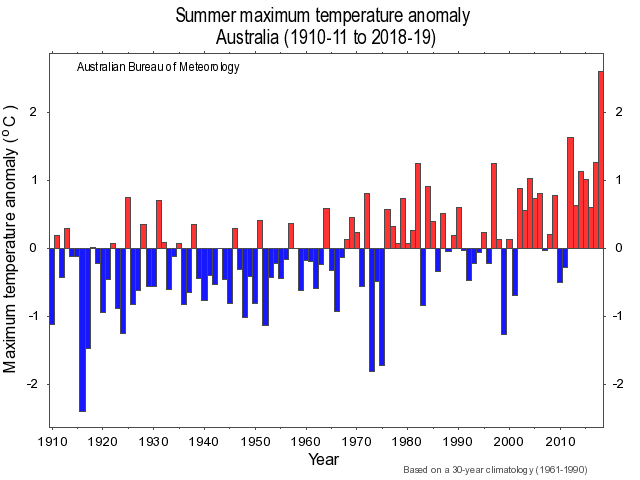 Nationally, summer mean temperatures have been about a degree higher than the previous record, as have average daily maximums. On the face of it, that does seem extraordinary. 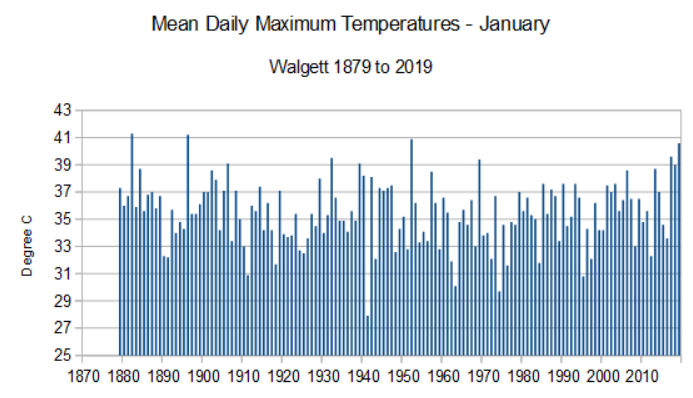 One of the longest running temperature records in NSW comes from Walgett, a tiny town in the interior, where temperature measurements date back to 1878. 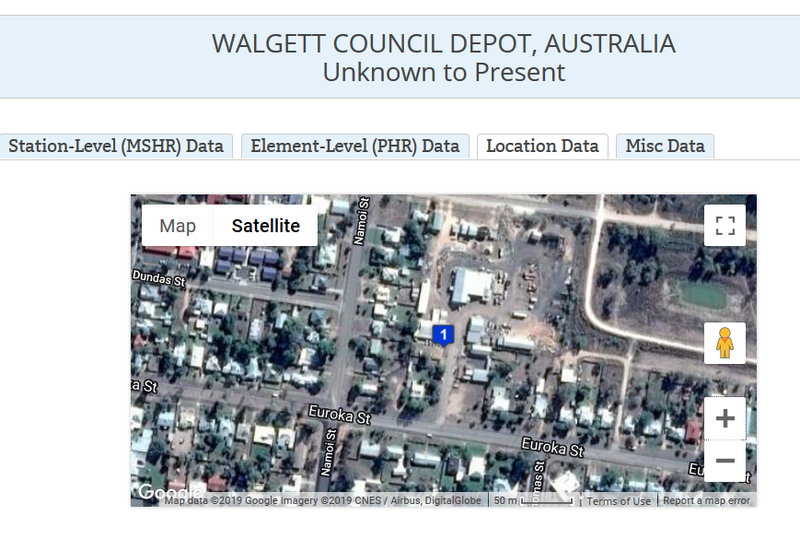 Even now, Walgett is pretty much unaffected by UHI, so long term trends are far more reliable than many other sites. Far from this year being the record, the hottest summer was actually back in 1900. This summer only ranks 5th, behind 2017, 1902 and 2006. 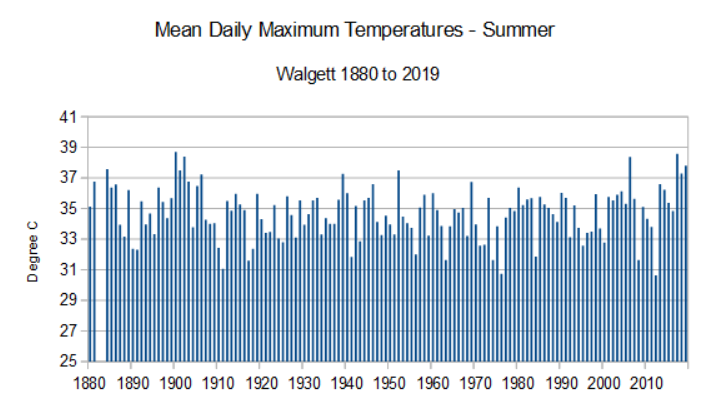 In fact, the spate of hot summers recently look little different to those of the early 1900s. 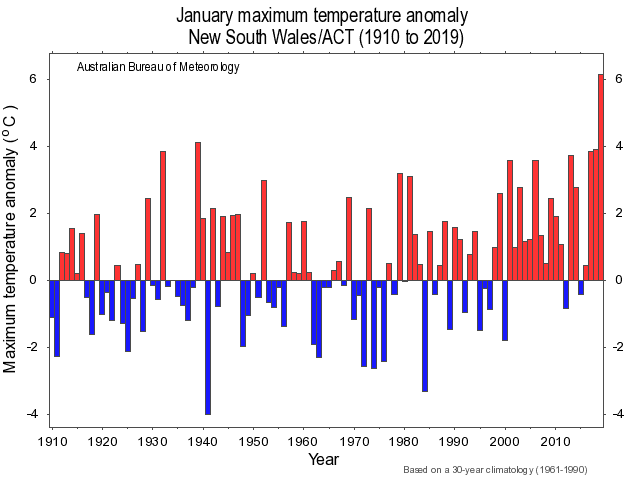 On a monthly basis, the only month which broke the record in NSW was January. 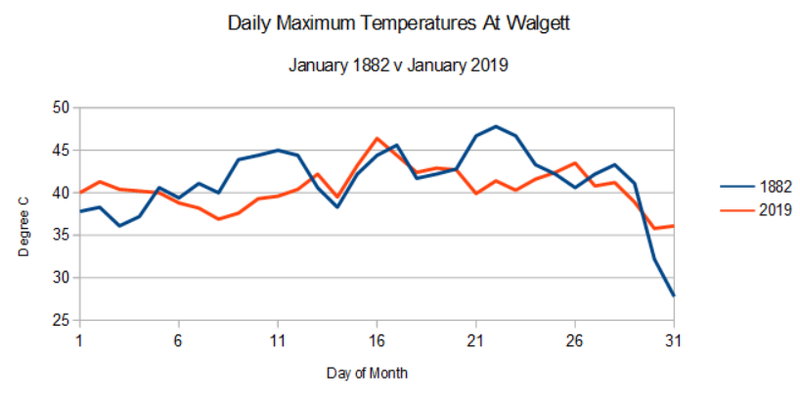 The all-time high for any month at Walgett is 49.2C, set in January 1903. 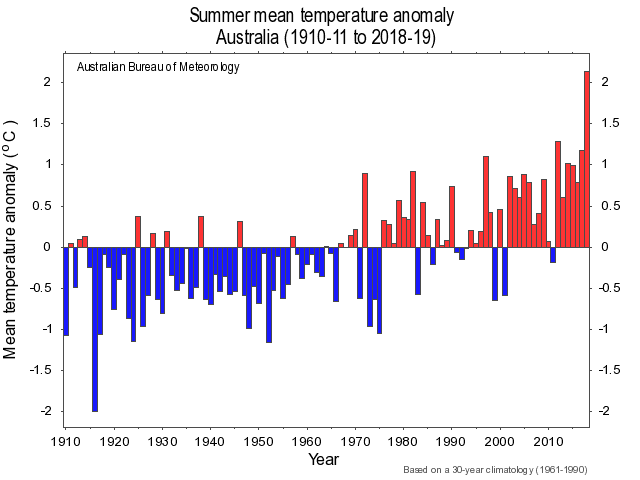 The BOM don’t like people knowing about those heatwaves prior to 1910. They claim that measurements were unreliable before then, yet much prefer to continue using data from the middle of big cities such as Sydney and Melbourne. 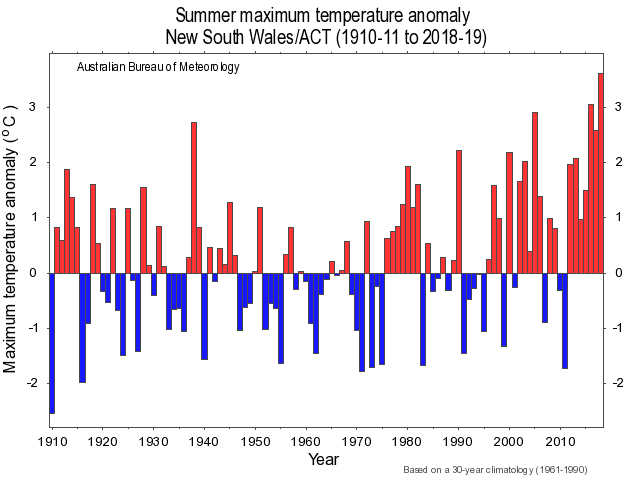 Whether older temperature measurements from the likes of Walgett are a tenth of a degree or so out, it is indisputable that those heatwaves did occur, and were extremely severe, as many accounts at the time testify. The weather station at Walgett was situated within the town until 1993, when it was switched to the airport, a short distance away. There was one month overlap, during which the airport temperatures registered 0.5C lower, seemingly indicating the UHI effect of the old site at the Council Depot. This is in spite of the fact that Walgett is still only a tiny town, with a population of 2267. What is clear though is that the Walgett of the 19thC, little more than a collection of wooden shacks, would not have had the same UHI effect as today with roads, houses and air conditioning. In other words, old Walgett is not an unreasonable comparison with the new airfield site, as far as UHI is concerned. First problem is the Aussie BoM is now notorious for changing the temperature records. They got Phil Jones request to fake the data and have been caught several times cooling the past and heating the present. Jo Nova has exposed alot of this as has Jennifer Marohasy. The excellent Aussie book ‘Climate change, the facts 2017’ edited by Jennifer has 2 chapters on the faking of Aus temp records and one chapter on faking the USA records by noaa and NASA. Of course Tony Heller exposes the faking of USA records on his excellent realclimatescience site. Alas official data is now bogus, and only old records that cant be ‘adjusted’ can be relied on. What is long-term? What is that three-month average? Evidence from a report from the lare 1800’s in South Australia shows that when a well shaded thermometer is compared to a Stevenson screen the temperature in the screen is higher. Meaning the temperature record should be adjusted up if anything…or even better leave the records alone altogether. None of this explains why the bom is adjusting minimums to show cooler minimums. Another modification is the removal of the asbestos insulator at the top of the screen in the 70’s replaced by a sheet of laminate, not even close to the same insulation qualities. Types of paint and the size of the box also have different qualities for repelling the direct heat from the sun. And without doing side by side analysis of all types and size screens, types of paint and even timber used it is impossible to know which were the most accurate. But reports of well shaded thermometers bursting gives an indicator of the extreme heat of the era. In the Adelaide Hills grape growers are reporting harvests of 50% (or less) of the usual amounts. Very cool weather before December blamed for reduced flowering. Walgett is also known as “The Black Stump”. Having been through Walgett a few times, I actually think it defines our “BEYOND the black stump’ idiom! Apropos nothing to do with climate, a barrister friend with a social conscience (yes they exist) used to do a lot of pro bono work at the court there, where his clients specialised in what he termed “the Walgett Defence”. They just didn’t turn up for their trial. The ‘odd’ cold finger of sea coming out of Central America I commented on before seemed to be disappearing, but now it is back and bigger. I think we are currently in a mild el nino, but might this be a developing la nina? Any ideas? Hmmmm only a few days later…..
Wasn’t especially hot here. One day at about 40 C and a few days at about 38 C. If anything that was less than usual. What did happen was quite a lot of blocking high weather patterns where high pressure systems get stuck in the Tasman Sea between the coast of Australia and the mountains of New Zealand. Nothing in climatista CO2 theory explains that – indeed it was most likely to be a relatively neutral SOI bringing the high pressure systems across at just the right latitude to plop into the Tasman Sea pocket. Blocking highs in the Tasman impede the eastward flow of the weather patterns and cause the air to heat up over the continent. Meanwhile BoM has been caught cooling the past again. The general flavour I also get is that there has been consistent over-forecasting of temperatures all summer. That is almost certainly due to the models BoM use, which are based on the notorious UK Met Office models. Spot on Bruce. The stalled high pressure cell in the Tasman Sea was very obvious. The heat came from central Australia not the chimney of our local power stations. I was recently given a copy of the diary of a family forebear, George Wyndham, dating from the Victorian era. He emigrated to Australia, where he founded the first commercial winery in the Hunter Valley, NSW. He records that in one year the heat on one occasion was so extreme that his thermometer was shattered.